Hello guys. Have you been to the spa lately? With all the goings on in my life coupled with my laziness, I haven't had any decent pamper-myself time for several months now. I still take care of my skin though and just make do with DIY thingies at home. It's the reason why I love masks. They're really convenient and cheap and do a good job of keeping my skin in tip-top shape. BeautyMNL recently had a BOGO on Leaders Insolution masks. 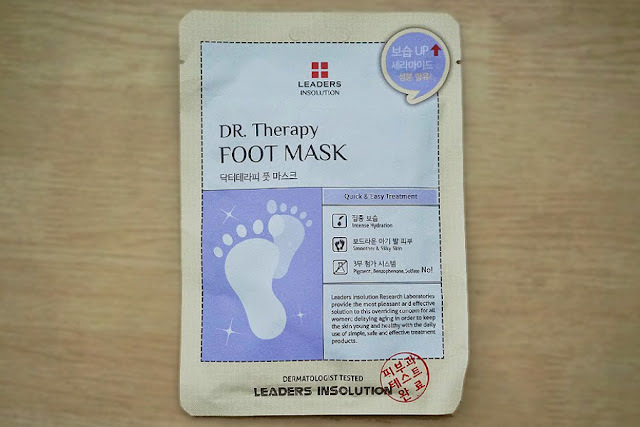 I have tried some of their masks before and liked them so I bought a bunch of them (more on that haul in the next post). 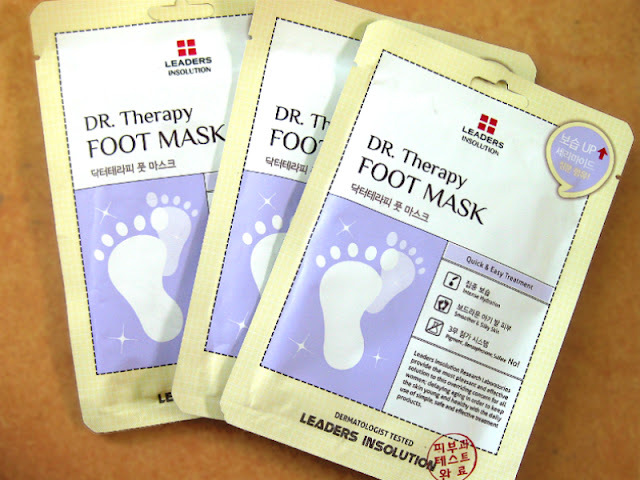 My feet really need some TLC right now so I decided to try out the Dr Therapy Foot Mask. First off the packaging. This came in standard plastic packaging with English and Korean labels in the front and back. Tearing off the top part was easy, I didn't need any scissors. 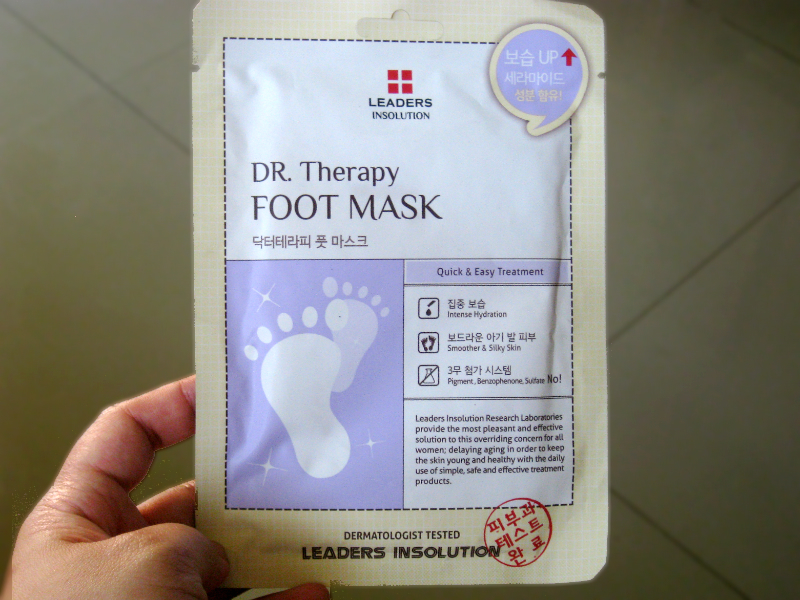 I noticed that the mask felt thinner (vs other foot masks I've tried) considering that this contain more product. Step 1: Wash and dry your feet. 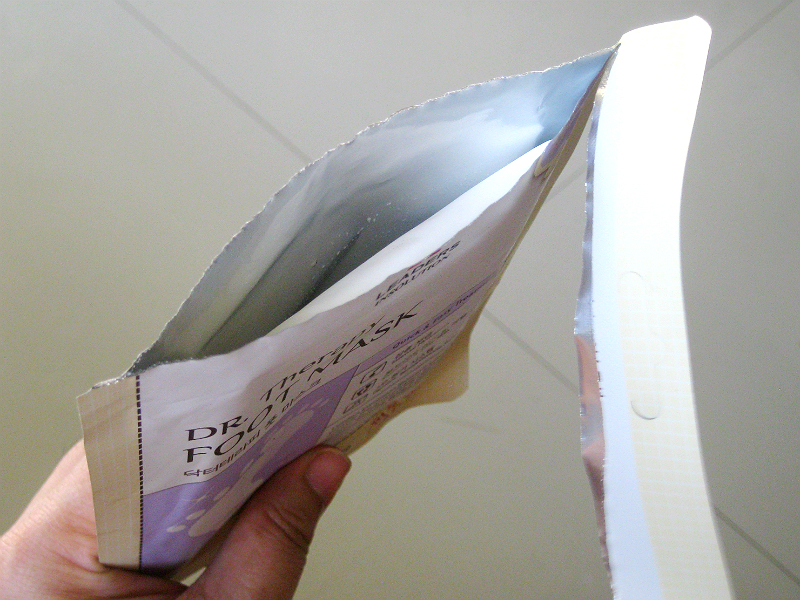 Step 2: Open the packet and divide it in half along the dotted line. Step 3: Apply onto feet as if you were putting socks on. 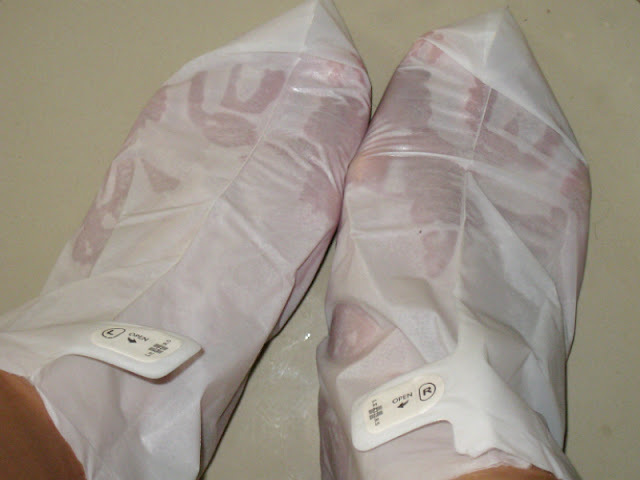 Step 4: Remove the sticker from the sheet and apply it around your ankles. Since I didn't read the instructions, I didn't realize that I was supposed to fasten them by peeling off the tabs on each mask. It was already after I took it off that I discovered such nifty detail. First Impressions: I like the way this mask was designed. The materials used were of good quality and they were really comfortable to wear. They did not slide off and I was able to walk (rather awkwardly) without sliding when needed. There were two layers for this mask, the plastic cover and the bio-cellulose layer that's soaked with the essence. The reason that this mask was on the thin side was because the bio-cellulose layer was really thin (but not flimsy) and there's really not much essence on it. 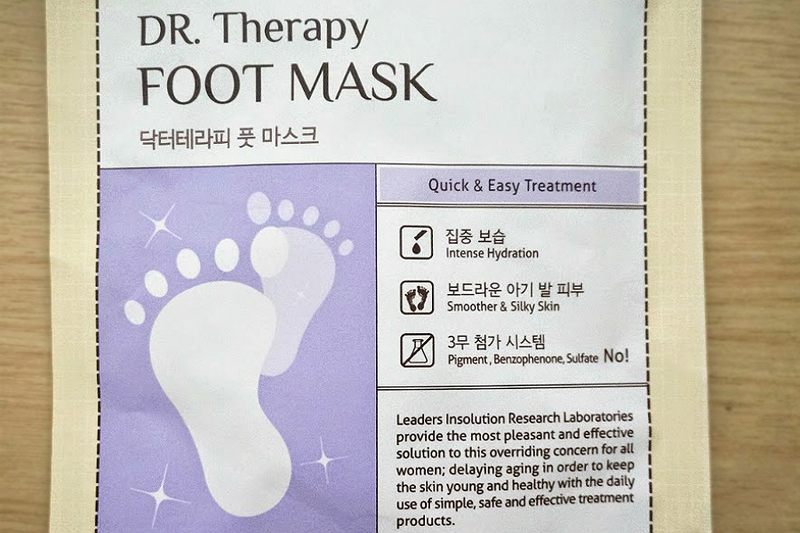 I first thought that after 30 minutes, this mask would dry up. Thankfully I was wrong. I had the mask on for an hour and when I took them off there the mask was still wet, I can probably use it for another 30 minutes or so without it drying up. 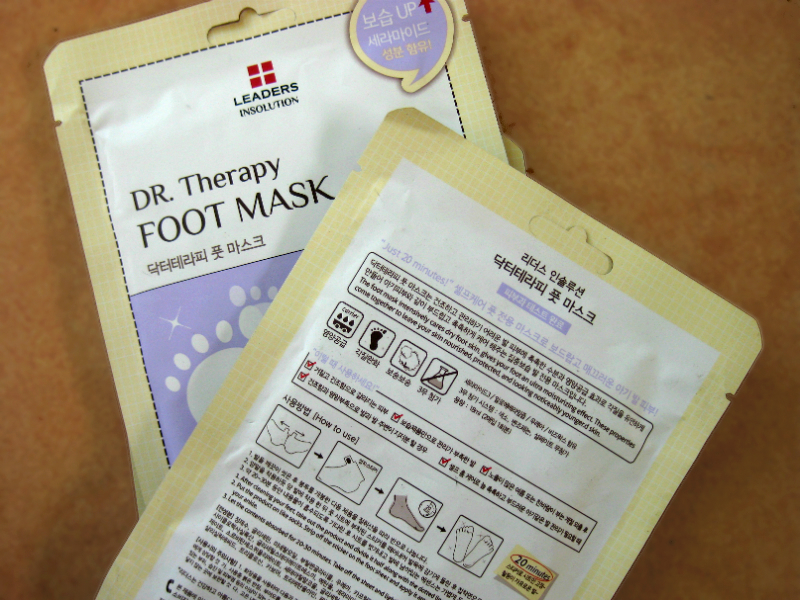 I also liked how the bio-cellulose really stuck to my foot, which means that my skin can absorb all the goodness it can offer. After an hour, I felt that this mask did help with the dryness of my feet. They felt softer and smoother. The roughness was lessened and there were less dry patches on my foot. You do need to use the mask on a regular basis (maybe 2x a week) for it to be effective in softening the more stubborn dry patches and calluses.